Get a chance to win refreshin' prizes! 1.) 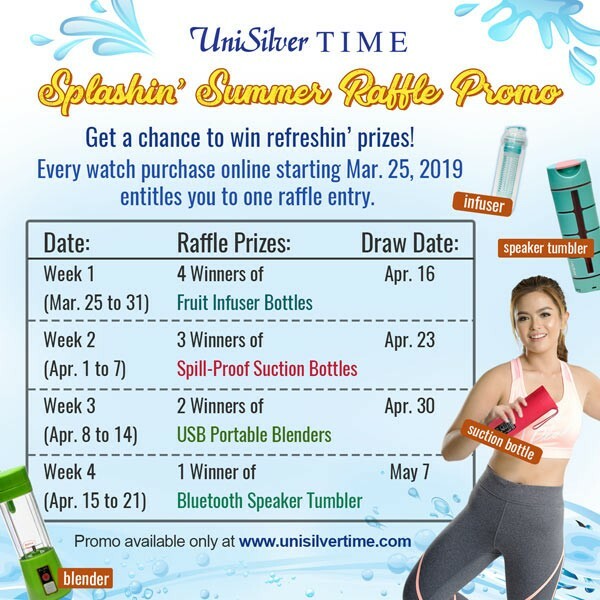 From March 25 to April 21, 2019, every watch purchased online through the UniSilver TIME website (www.unisilvertime.com) entitles a customer to 1 raffle entry to win a prize for that week. 5.) A customer can only win once in a week, but he can still make purchases in the other weeks for more chances of winning. 6.) The winners' names will be posted on UniSilver TIME's website and Facebook fan page www.facebook.com/wwwunisilvertimecom on the draw dates. 7.) The winners will be notified on how to claim the prizes. 8.) Winners can claim the prize at UniSilver TIME's head office at the Chronotron Inc., 10th Floor, UGIC Tower, #684 Tomas Mapua St. (near corner Soler St.), Sta. Cruz, Manila or at any nearby UniSilver TIME store. 9.) To claim the prize, a winner must present a valid ID (Company ID, School ID, SSS ID, Comelec ID, Postal ID, Senior Citizen's ID, Passport, or NBI / Police Clearance). 10.) The prizes are not transferable and not convertible to cash. 11.) Unclaimed prize after 60 days from receipt of notification will be forfeited. 12.) Employees of Chronotron, Inc. including their relatives up to the second degree of consanguinity or affinity are disqualified from joining this promo. Promo period: March 25 to April 21, 2019. About the Author: Borderline Millennial, Conspiracy Theorist, and Watch Enthusiast since 2010. Spends most of his time raising Bok-Bok, a bull terrier, and Jill, a Jack Russell Terrier.